Fresno, CA-In response to customer requests, Trail-Gear has expanded its Rock Assault™ line with the addition of a Power Steering Pump with Tacoma Serpentine Pulley kit, released today (Friday, June 15, 2012). This new steering kit combines Trail-Gear’s 1,450 PSI or 1,650 PSI power steering pumps with a Tacoma Serpentine Pulley. 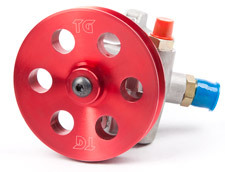 The TC style power steering pumps feature all steel housings to handle extreme heat and put out 4 GPM or 4.5 GPM of flow and 1,450 PSI or 1,650 PSI of pressure, respectively. Each pump is bench tested to ensure quality. The 1,450 PSI pump is designed for use in a hydraulic ram assist application and the 1,650 PSI pump will run all full hydraulic applications popularly used in rock crawling today. The 1,650 PSI pump has a #6 JIC male fitting on the pressure port and a #10 JIC fitting on the suction side. The pulley is precision CNC machined from 6061 T6 Aluminum and anodized red for corrosion- resistance. The center hole bore diameter is .660″ and the total outside diameter of the pulley is 4 3/4″. The serpentine pulley fits 2.7L and 3.4L Tacoma applications in addition to many other common serpentine belt applications that use a 4 rib belt. Rock Assault™ Power Steering Pump with Tacoma Serpentine Pulley kit from any authorized Trail-Gear dealer or via the Trail-Gear website: www.trail-gear.com. The 1450 PSI version retails for $179 and the 1650 PSI version retails for $229 on the Trail-Gear website.